Choose now: a life of love with the person of your dreams or a life dedicated to the cause you hold most dear. Just before the outbreak of World War II, African-American musician Thomas Greene arrives in Shanghai to lead a jazz orchestra. Song Yuhua, a translator, tutored in English since childhood, works for crime boss Du Yuesheng as an indentured servant in payment for her father’s gambling debt. Thomas, who struggled merely to survive in the segregated South, finds in Shanghai an opulent world unlike any he has ever known, where at last he has the freedom to play on an equal stage. Song also longs for freedom, and can find it only by secretly joining the Communist Party and spying on her master—until she meets Thomas, who opens her to an ardor she never thought she could feel, even though contact between them is as forbidden as it is dangerous. Meanwhile, Lin Ming, Thomas’s friend and Song’s brother, insists that he take no sides and back no cause, but then the war draws him into a grand (and true-to-life) plan to save 100,000 Jewish lives by creating a resettlement zone in western China, along the Burmese border. In a glittering city dominated by a criminal gang, with worldwide war erupting, all three struggle to find a place for themselves, a way to play music, to love, and somehow to make their beliefs count. Ahmad Alaadeen said, “Jazz does not belong to one race or culture, but is a gift that America has given the world.” Nicole Mones has said that by the time she completed Night in Shanghai, she saw how much she had been driven by one layer of the book’s meaning: America is in a song. Or as it might be put in Chinese, ge tan Meiguo. The American song form, mediated through jazz, was a force of modernization in 1930s Shanghai. One of America’s greatest exports to the world, jazz in China left its influence behind in broadened minds and hearts, as well as in the musical trends that were to follow. 1. Before the novel begins, Mones offers this Chinese adage: “An inch of time is worth an inch of gold. An inch of gold cannot buy an inch of time.” This saying comes from an ancient text that imparted life lessons to children. What lesson do you take from it? What do you think it meant to Thomas, Song, and Lin? 2. The historian Poshek Fu wrote that all educated people in Shanghai had to choose between passivity, resistance, and collaboration in the years covered by Night in Shanghai. How do you see Thomas, Lin, and Song navigating this choice—and how does each change as the novel unfolds? What would you have done in their place? 3. Chiang Kai-shek pursued a policy of “first internal pacification, then external resistance” (2), because he thought the Communists posed a greater threat to China than the Japanese invasion. Looking back from today, do you think he was correct? Or do you think Song was right to build her life around opposing this? 4. Song says, “Jazz was the sun around which this paradise revolved” (2). In the 1930s, jazz was very popular around the world, perhaps the defining music of its era. What do you think has been the defining music of your era? How has that music shaped and enriched your life? 5. Mones shares an uncomfortable moment when Thomas is first faced with a coolie who wants to pull him in a rickshaw. How would the typical American react, then and now? How would you have reacted? 6. When we are far from home, familiar objects bring us comfort. Thomas cherishes a kerosene lamp that reminds him of the one his mother used. What things or activities bring you the serenity of home when you are away? 7. Song believes in the dream that “she might meet her comparable other, a man who lived his life as she lived hers” (49). She credits this belief, atypical for a Chinese of her time, to the Western stories she read in her youth when she was learning English. Do you think your hopes and dreams were influenced to some degree by the stories you read and loved when you were young? 8. Sometimes it is the most devastating moments that move us to act. What does Song witness to cause her to decide “that this was the last time she would feel so impotent against evil” (61)? What difficult and powerful decision does she make in response? 9. Thomas confronts a German who has spoken scathingly of Jews: “‘You are wrong about me,’ said Thomas firmly. ‘They are filth?’ He steadied his gaze right in the German’s eyes. ‘Then I am exactly like them’” (102). Do you think this was effective? It can be difficult to talk back to someone who expresses prejudice. What would you have said? 10. “When he came to the last phrase and the final, tonic D-flat chord, home again, it sounded the deep bump of their lighter against the wharf, the magic moment they disembarked, he and Lin, the beginning and the end. He let the note hang and then rested his hands in his lap until the drumming of rain once again filled the room, nothing else. He had played as well as ever before” (145). Thomas has just moved to a higher level in his creative life. Does it seem strange that he reached this pinnacle not by trying, but by letting go? Have you ever experienced this type of breakthrough? 11. Kenneth Bonert, in his novel The Lion Seeker, creates a memorable character named Hugo Bleznick who says there is always “the twist.” Mones conveys the same idea when Thomas mentions “the unexpected ninth in Duke Ellington’s ‘Blue Ramble’” (151). Mones calls this small but crucial reversal “the turn” (151). Have you ever felt a situation in life pivot this way, on a particular, perceptible hinge? What different forms can “the turn” take? 12. “Everything had happened so quickly—the turn, the discord, the unexpected ninth—and now he was broke, and could not leave. And yet Song had come to him too, which in its own way made it right, all of it” (153). Going beyond “the turn,” Mones relates life to music throughout the novel. Italian terms used to denote expression in classical music notation carry Thomas’s feelings, all the book’s central relationships begin with music, and Thomas’s struggle for freedom is played out at the piano. Have you ever had a metaphor or discipline through which you viewed all of life, even for a time? 13. Jazz musician Charlie Parker said, “Music is your experience, your thoughts, your wisdom. If you don’t live it, it won’t come out of your horn.” What living does Thomas have to accomplish before he can finally throw off his fetters at the piano? What makes it possible for him? 14. “I was reborn first through the movement, and then again, through him. After our time together I knew, no matter where the two of us were, that while he lived, I would never be alone. I knew I would return to him. But just as much, I knew I needed to go north” (180). Many people struggle to find a balance between love and self-actualization. Do you think Thomas and Song made the right decisions? What do you think would have happened to them, and to their feelings for each other, if they had chosen differently? 15. 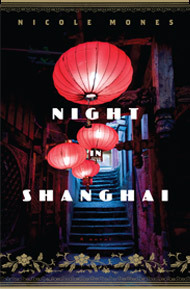 All the major events in Night in Shanghai actually happened, and except for Thomas Greene, Song Yuhua, Lin Ming, and David Epstein, almost all the book’s characters really lived (and can be seen in photos and film on the author’s website). The novel ends with a nonfiction-style epilogue. Did the novel’s fidelity to true events affect your perception of the story? Do you think there is something different about a story based on true events? 16. 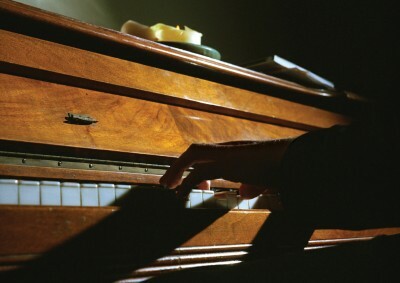 “He lost himself in his dreams of Song, but in his rational moments, he was aware of life slipping away” (211). Do you think Thomas sacrifices too much in waiting for her? In the end, who makes the greatest sacrifice, Thomas or Song? Explain. 17. When Thomas and David play for refugee audiences, they realize their music provides a powerful and poignant memory of the past that has been left behind forever. Thomas thinks, “This is what they want from music, a feeling, a connection to another time” (214). Do you ever listen to music to feel connected to another time? To what times and places does music carry you back? 18. At novel’s end, the reader learns that Song is imprisoned for some time, denounced as a spy. In her cell, Song endures an unusual punishment: “I may lie only on my left side. I must always face the door, my hands visible. There is a paradise on my right side, a place of singing angels, and I dream of it every night. Even Thomas waits for me there. But I may not turn” (272). What makes this punishment a “masterstroke”? Through years of such difficult confinement, how does Song maintain her freedom? 19. Thomas reaches maturity as an artist when he learns to improvise. Bix Beiderbecke said, “One thing I like about jazz, kid, is that I don’t know what’s going to happen next. Do you?” Thomas is also able to start improvising with his life, and in the wake of war, to make braver and more unexpected choices. Song and Lin must do the same. How does this arc, common to all three characters, also serve to turn the story in directions you did not expect?